THE boat of the sun having passed through the Second Division of the Tuat arrives at the gateway which leads to the THIRD DIVISION. This gateway is unlike the first, which has already been described, for its opening is protected by an outwork, similar to that which protects the door of a fortified building. The outwork is guarded by nine gods, in the form of mummies, who are described as the “second company of the gods,”  and in this wall, which completely divides the Second Division from the Third,  is an opening, which leads to a corridor that runs between two walls, the tops of which are protected by rows of pointed stakes. 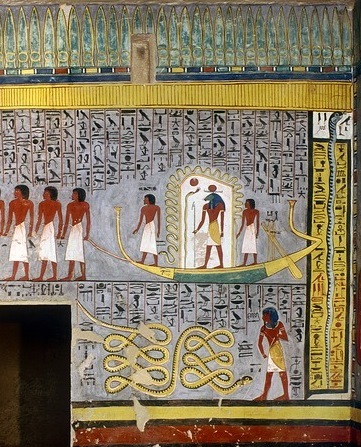 At the entrance to the corridor stands a god, in mummied form, called AM-AUA, and at the exit is a similar god called SEKHABESNEFUNEN, each is said to “extend his arms and hands to Ra.” At each side of the angle, near the entrance to the corridor, is a serpent, who ejects flames from his mouth: the flame from the one sweeps along the corridor, at the end of which it is met by the flame from the other serpent which sweeps along the inside of the inner wall. The flames of these serpents are said to be for Ra. 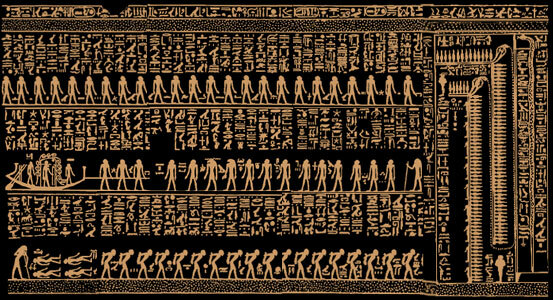 The gateway leading to the Third Division is called SEPTET-UAUAU,  and the door thereof, which opens inwards, is guarded by the serpent standing on his tail, who is called AQEBI,  and faces outwards. “to become to bear up. this (2x). god., [by using] them (ad.souls). to make to breathe. the words. [of] adam-within. [by means of] this (tn). sebekht-gate. of [=for]. to enter (ãq). existence (eden’s). this. sebekht-gate. [for] the speech. this. god., [and] existence of hail. the ‘to shoot-out’is eden-eye related; perhaps the re-ordering is on purpose?